Toy Gun Town GREAT BIG TEXAS WELCOME. HOME OF THE FAMOUS BRONCO 44 DIECAST METAL WESTERN TOY CAP GUN! MADE IN TEXAS U.S.A.. THE TOUGHEST BEST CAP PISTOL IN THE WORLD! WE USE PAYPAL TO ACCEPT ALL OUR PAYMENTS ! YOU CAN USE YOUR VISA, MASTERCARD, DISCOVER or PAYPAL THROUGH THE PAYPAL CHECKOUT ! Thanks for shopping with Wild West Toys ToyGunTown website. Wild West Toys is the only manufacturer of U.S.A. made cap guns . Wild West Toys owns many of the toy molds that were made in the USA during the 1950s and the 1960s most of these molds would have been scrapped had we not purchased them & the toys they are capable of producing would have been lost forever. If you purchase from us let me say we are Human and sometimes we do make mistakes when this happens we ask that you let us do our best to correct them. We are very Blessed to be making toys in the USA . We are also sure that God has blessed us with the ability to do so and we are very thankful for this opportunity. If you are looking for direction in your life Please look to God for the answers because he loves you and truley cares about your direction and happiness - John 3:16 of the Holy Bible says - For God so loved the world, that he gave his only begotten Son, that whosoever believeth in him should not perish, but have everlasting life. ROY, DALE, GENE, HOPPY AND THE LONE RANGER ALL STOOD FOR WHAT WAS GOOD & RIGHT . THEY OFTEN HAD LESSONS ABOUT GOD AND COUNTRY. THAT IS WHAT LED MY FAMILY AND I INTO THE WESTERN TOYS ( COLLECTING AND MANUFACTURING ) HOPE TA SEE YA AGAIN ON DOWN THE TRAIL & MAY THA GOOD LORD TAKE A LIKIN TO YA ! WE HAVE REMODELED OUR SHOPPING CART BECAUSE THE OLD ONE WAS OUTDATED. WHEN YOU ADD ITEMS TO CART NOW IT IS A CART CONTROLLED AND PROTECTED BY PAY PAL. THE SHOPPING CART ICON AT THE TOP OF OUR SITE NO LONGER HOLDS YOUR ITEMS AND WE ARE WORKING TO REMOVE THE ICON. PLEASE CALL US if you need assistance. MON. - FRI. 10:30AM - 5:00PM CENTRAL TIME. 817-444-4320. SORRY WE ARE NOT DOING ANY REPAIRS AT THIS TIME! WE CAN SELL YOU THE PARTS TO REPAIR OUR CAP GUNS BUT WE ARE TOO SHORT STAFFED TO DO THE REPAIRS AT THIS TIME. We only do mail order at this time! Our outlet store located at 106 west street main Azle Texas is closed at this time! We have also been on several TV shows! Here are The segments from Texas Country Reporter and most of Wild West Toys segment on the Science Channel show How It's Made. toy cap gun pistols imported from all over the world ! CHECK OUT THE NEW SINGLE ACTION ARMY 45 CAP GUN PISTOLS! IF YOU HAVE ANY TROUBLE WITH THE CHECKOUT PLEASE CALL US. MON. - FRI. 10:30AM - 5:00PM CENTRAL TIME. 817-444-4320.
toy cap guns with inexspensive holsters. IF YOU HAVE ANY TROUBLE WITH THE CHECKOUT PLEASE CALL US. MON. - FRI. 10:30AM - 5:00PM CENTRAL TIME. 817-444-4320.
toy cap gun holsters in adult sizes. IF YOU HAVE ANY TROUBLE WITH THE CHECKOUT PLEASE CALL US. MON. - FRI. 10:30AM - 5:00PM CENTRAL TIME. 817-444-4320. Toy gun cap gun caps of every kind . Also hard to find vintage cap gun caps ....... Caps are not included free in with an order . If you want caps you must order them! IF YOU HAVE ANY TROUBLE WITH THE CHECKOUT PLEASE CALL US. MON. - FRI. 10:30AM - 5:00PM CENTRAL TIME. 817-444-4320. Special Limited Collectors Toy Guns . We build most all of the American made toys we carry and we stay very busy so if you order USA made toys from us please allow 2 - 2 1/2 weeks for delivery . IF YOU HAVE ANY TROUBLE WITH THE CHECKOUT PLEASE CALL US. MON. - FRI. 10:30AM - 5:00PM CENTRAL TIME. 817-444-4320. Check out the NEW 1873 ARMY TOY GUNS! IF YOU HAVE ANY TROUBLE WITH THE CHECKOUT PLEASE CALL US. MON. - FRI. 10:30AM - 5:00PM CENTRAL TIME. 817-444-4320. Toy cap gun holster supplies replacement springs and parts . Hammers, Triggers, Springs and parts. IF YOU HAVE ANY TROUBLE WITH THE CHECKOUT PLEASE CALL US. MON. - FRI. 10:30AM - 5:00PM CENTRAL TIME. 817-444-4320. Reissues of Real Metal Retired Western Badges. Not for small children ! Pin clip is sharp like a real badge! IF YOU HAVE ANY TROUBLE WITH THE CHECKOUT PLEASE CALL US. MON. - FRI. 10:30AM - 5:00PM CENTRAL TIME. 817-444-4320. Roy Rogers, Dale Evans, Lone Ranger, Hopalong Cassidy, Gene Autry toys & accessories. IF YOU HAVE ANY TROUBLE WITH THE CHECKOUT PLEASE CALL US. MON. - FRI. 10:30AM - 5:00PM CENTRAL TIME. 817-444-4320. Toy Soldiers, Playsets, Plastic Toy Cowboys and Indians. REMEMBER WHEN ORDERING FROM THIS SECTION WE DO HAVE A $10.00 MINIMUM ORDER! IF YOU HAVE ANY TROUBLE WITH THE CHECKOUT PLEASE CALL US. MON. - FRI. 10:30AM - 5:00PM CENTRAL TIME. 817-444-4320. Wild West Toys Out of appreciation for all our wonderful customers has set up WWW.WESTERNSONTHEWEB.COM HUNDREDS - of family friendly westerns . Some we have uploaded and some we have rounded up from the internet from other sites that allow embedding . JUST CLICK ON THE THEATER TO GO TO OUR FREE ONLINE WESTERN MOVIE SITE ! Thanks again Bob Terry WWT. We are a small family business we ship out once a week . WE CHARGE A FLAT RATE OF $10.00 SHIPPING PER ORDER SO THE MORE YOU ORDER AT A TIME THE MORE YOU SAVE! IF YOU NEED AN ORDER IN A HURRY PLEASE BE INFORMED . We build most all of the American made toys we carry and we stay very busy so if you order USA made toys from us please allow 2 - 2 1/2 weeks for delivery . Please note: We have a minimum order amount of $10.00 for mail out orders ! Our store located at 106 west main Azle Texas is now closed! IF YOU HAVE QUESTIONS ABOUT ANY OF THE PRODUCTS PLEASE EMAIL US AT wildwesttoys(at)aol(dot)com........ RETURNS ....... ANY RETURNS OR REPAIRS MUST BE SHIPPED TO US USPS P.O. BOX 1341 AZLE TEXAS 76098 - WE DESCRIBE ITEMS AS BEST WE CAN & WE TEST EVERY ITEM SEVERAL TIMES BEFORE IT IS SHIPPED OUT - YOU MAY RETURN ANY UNDAMAGED & UNUSED ITEM FOR A REFUND EXCLUDING SHIPPING COSTS & a $10.00 restocking fee . Caps are not included free in with an order . If you want caps you must order them ! As stated before we are a small family business we do not send out shipping confirmations or notifications this would take extra time and hold up orders. If you have questions about your order please call Tuesday - Friday 10:30 am to 5:00 pm central time 817-444-4320. NOTICE: Our Toy Guns Have The orange Plugs, IT IS FEDERAL LAW ! . WE DO NOT SHIP OUTSIDE OF THE U.S.A. ..... ( California residents ) any toy or cap guns colored black, silver or otherwise outlawed by California can not be shipped to you . Unless it is to be used in a theatrical production of some kind or if it is for collectors purposes . ------- New York State - we cannot ship any toy guns to you unless it is for a theatrical production of some kind - So if you are in California or New York please only order if it is legal to send the toys to you ! . 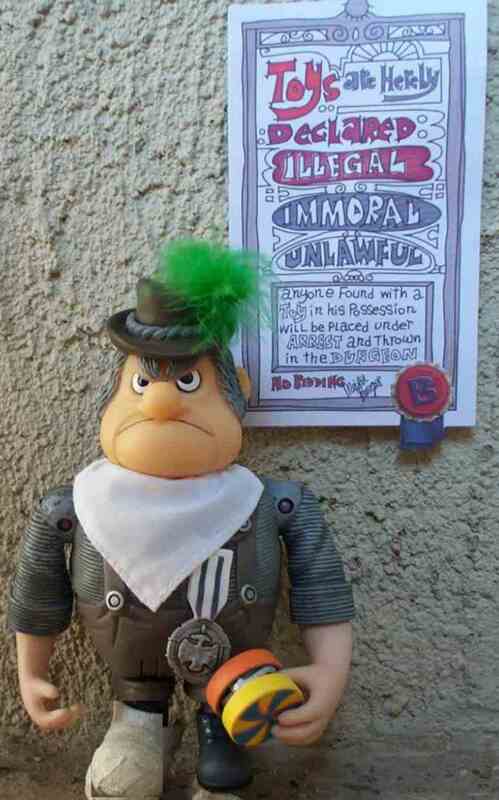 ------- SomberTown - we cannot ship any toys to you because the Bergermeister Meisterburger has posted TOYS are Hereby Declared - ILLEGAL , IMMORAL , UNLAWFUL anyone Found with a Toy in his Possession will be placed under ARREST and Thrown in the DUNGEON - NO KIDDING Meister Burger Please check with your City and State for any laws concerning toy guns. THANKS AND HAPPY TRAILS.....WWT . CALL WILD WEST TOYS MONDAY - FRIDAY 10:30am - 5:00pm central time 817-444-4320.